This page documents how bills pushed by ALEC corporations result in taxpayers subsidizing the profits of the private prison industry by putting more people in for-profit prisons and keeping them in jail for longer. The bills also would put more guns on streets and interfere with local law enforcement decisions about how best to interact with immigrant communities. Through ALEC, corporations have both a VOICE and a VOTE on specific state laws through these model bills. Do you? You can access these ALEC "model" bills on guns, prisons, crime, and immigration here. Download a one-page fact sheet on ALEC and guns, prisons, crime, and immigration here. How Are Corporations Interfering With Our Criminal Justice System? Corporations and their politician allies voted behind closed doors through ALEC to change America's criminal justice system and enrich profits. On the surface, many ALEC bills look like basic tough-on-crime legislation, but some corporate leaders of ALEC benefit financially from such legislation -- meaning that what has been sold to the public as good for public safety was often pushed by corporations that profit from such changes in the law, without politicians disclosing their corporate allies' financial interest to the public when such bills, pre-approved by the corporations, were introduced. Expanding the list of offenses for which a person must pay a for-profit bail-bondsman for their release. (See also this bill and this bill). Eliminating pre-trial release agencies that pursue evidence-based, public-safety oriented methods of release that don't require paying a for-profit business, or imposing new burdens on those agencies. Imposing notification technicalities on courts. Treating juveniles like adults. See also here. Not in the zip file, but on The Heartland Institute website, is the "Private Correctional Facilities Act" from 1995, which opens a state to for-profit incarceration. Imposing new regulations on swap meets and flea markets that may compete with retail stores. Other drug use-related bills would require that any college student convicted of a drug crime lose financial aid, promote drug testing in American workplaces, even if the work has nothing to do with public safety, and suspend the driver's license of anyone convicted of a drug crime. The bills also include anti-immigrant legislation that require local law enforcement to enforce complex federal law, result in racial or ethnic profiling, and destroy the law enforcement-community relationship. (See Arizona's SB1070 model here, as well as this bill, this bill and this bill). Eliminate the rule against hearsay when determining whether probable cause existed. Still other bills would aid corporations in other ways, like bills to punish homeowners for the mortgage crisis by creating the crime of "mortgage fraud," that focuses primarily on consumers, but no corresponding new crimes for the Wall Street shell game that sank the U.S. economy. For many years, until this spring, the National Rifle Association (NRA) actually co-chaired the ALEC "Task Force on Public Safety and Elections." (The election bills are discussed in the section of this site titled "Democracy, Voter Rights and Federal Power.") ALEC bills include "model" legislation that advances the constitutionality of an individual's right to bear arms, an argument vindicated by a recent ruling of the U.S. Supreme Court. The legislation also would likely benefit the firearms industry closely connected to the NRA. Oppose bans on semi-automatic firearms like the one used in the shooting in Arizona that killed nine people and seriously injured Congresswoman Gabrielle Giffords. Oppose waiting periods for criminal and mental health background checks for firearm purchases. Support concealed-carry gun laws see also here. Oppose efforts by law enforcement to use their purchasing power get gun manufacturers not to market guns or ammo likely to be used against police, like "cop killer bullets" that pierce armor. Prohibit local counties or cities from enacting firearm restrictions, or emergency measures that could be abused. Encourage guns on campus, and for younger kids. For a full list of bills from this section, click here. In February 2012, 17-year-old Trayvon Martin was shot and killed by 28-year-old George Zimmerman as the unarmed high school student returned from a 7-11 with an iced tea and bag of Skittles. Police initially failed to arrest Zimmerman because of the state's "Stand Your Ground" law, which goes beyond the traditional right to self defense by establishing a legal presumption of immunity if a killer claims they had a reasonable fear of bodily harm. The law has been described as an invitation to vigilantism and a "license to kill." In March 2012, CMD reported that NRA lobbyist Marion Hammer helped draft the Florida law in 2005, and "stared down legislators as they voted" to pass it. 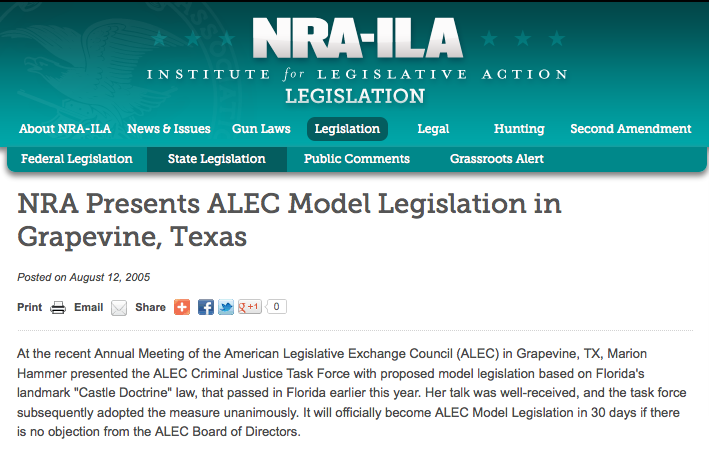 Just a few months later, Hammer presented the bill to ALEC's Criminal Justice Task Force (now known as the Public Safety and Elections Task Force), and the NRA boasted that "[h]er talk was well-received." The corporations and state legislators on the Task Force -- which was chaired by Wal-Mart, the nation's largest retailer of long guns -- voted unanimously to approve the bill as an ALEC "model bill." Since becoming an ALEC model it has become law in dozens of other states, and the number of homicides classified as "justifiable" has dramatically increased. In December 2009, months before the Arizona legislature took up its highly controversial immigration bill (SB 1070), for-profit prison and bail industry lobbyists gathered behind closed doors with state legislators at an ALEC meeting where the "No Sanctuary Cities for Illegal Immigrants Act" was approved as a "model bill" to be introduced in statehouses across the country. The National Rifle Association was then the private sector co-chair of that ALEC task force. After the bill was approved by ALEC corporations and legislators, it was introduced in Arizona by Russell Pearce, a longtime ALEC member. At the time, the private sector members of the ALEC Task Force included for-profit prison operator Corrections Corporation of America (CCA), which before the meeting had identified immigrant detention as a profit center important for its future growth, stating it anticipated receiving "a significant portion of our revenues" from detaining immigrants. Around half of all immigrant detention facilities are operated by for-profit corporations. After the Arizona bill was introduced, 30 of the bill's 36 co-sponsors promptly received campaign contributions from donors in the for-profit prison industry. Russell Pearce lost his seat in a recall election November 8, 2011. The vote was widely seen as a referendum on the anti-immigration legislation. In June 2012, the U.S. Supreme Court struck down most of the provisions of the Arizona bill. The Court held that striking down the law's controversial "papers please" provision would be premature, but narrowed the provision's application and made clear that it could be challenged at a future date.